From the February 8, 2010 job offer on ProZ.com, you might never have guessed that a scandal was brewing. In fact, it was a job announcement like many of the offers that appear on ProZ, especially in combinations into or out of Italian or that involve Italy-based translation agencies: the pay was bottom-scraping (€0.02 or about $0.03 per word); the rate had been calculated on the basis of an entirely fabricated “page” that was 175% larger than the measure typically used by translators in Italy; and the outsourcer warned the translator not to expect to be paid any early than at least ninety days after delivery. But the job offerer, the Novara, Italy-based translation agency, Trust Traduzioni, made a couple of errors that pushed the flaws in ProZ’s system—flaws that translators had been complaining about since at least 2002—into the spotlight. In specific, Trust Traduzioni claimed that the onerous conditions in its announcement were not its doing, but were all “requirements of the end client.” That end client, in this case, was the Italian Ministry of Tourism, a government agency. The problem was, first of all, that the ninety-day payment term was a violation of European Union and Italian law, which requires invoices for commercial transactions to be settled in thirty days not ninety. Why, translators asked, didn’t ProZ vet an announcement that required freelance translators to accept an illegal job condition? Second, Italian translators were disgusted to realize that the sweatshop wages in question were apparently coming from their own government. Low-end, fly-by-night private agencies in pursuit of a quick buck were par for the course. Price dumping on the part of one of Italy’s largest ministries—the agency in charge of one of the few thriving industries in a largely stagnant Italian economy—was literally shameful. A petition drive was organized in protest and some 1200 translators signed on in less than forty-eight hours. Several Italian daily newspapers carried the story and, nine days after the offending job announcement, the Italian Minister of Tourism, Michela Vittoria Brambilla, formally responded to the controversy with a statement that Trust Traduzioni’s posting “imputed untrue information to the Ministry of Tourism”; what’s more, Brambilla insisted, “the Ministry … does not apply and has no intention of applying the fees and conditions indicated in the announcement.” That almost sounded like good news. The petition had barely been online twenty-four hours when ProZ’s Dotterer contacted the petition’s organizers to object to what he called two “inaccuracies” in the text. So let’s take those one at a time. With regard to Dotterer’s first argument, ProZ allowed (and still allows) job posters to indicate the amount they are offering for each project. Only in some hyper-legalistic realm of imaginary language does this not constitute “setting prices.” In the real world, that’s precisely what it does: It tells the translator the maximum the client intends to pay. Despite all the evidence to the contrary, in other words, Dotterer seemed to be suggesting that translators held bargaining power in ProZ-based transactions and could negotiate rates higher than the advertised maximums. Anyone who has ever responded to one of ProZ’s cut-rate job announcements, however, knows the truth. The best a translator can hope for is that, when the outsourcer responds to refuse your request for a higher rate, he doesn’t insult your parentage as well. Henry Dotterer may be the only person living who believes that the prices set (established, fixed, determined) by ProZ’s outsourcers are up for negotiation but it was, in any case, precisely the fact that ProZ “does not get involved” in this distortion of the proper client/service provider relationship that led to the petition in the first place. Immediately after the petition was delivered, a small group of translators began working on the draft of a proposal to ProZ aimed at remedying the specific problems that translators had identified. That proposal (posted here) was delivered to Henry Dotterer on 19 March 2010. What followed was an intense couple of weeks in which each individual point of the ProZ Proposal was dissected and discussed on forums that Dotterer set up within ProZ. Much was said. Much seemed possible. And, in the end, ProZ did nothing. Or, to be fair, ProZ created an elaborate new system for its job board that allowed translators to change their notification settings and, in so doing, to elect to see or not to see the rates posted by outsourcers. It also got out its Orwell dictionary and found a pleasant-sounding euphemism to employ. From now on, job posters would no longer indicate their price. They would indicate their budget. Put it another way. The ProZ Petition—and the petition’s supporters who joined the ProZ forums to discuss the 19 March 2010 proposal—argued that allowing outsourcers to state maximum prices undermined translators’ position in the client/service provider relationship and created ongoing downward pressure on translation rates. Making that small change—prohibiting any mention of rates on the part of a job poster—would have accomplished two goals, one immediate and one long-term. The immediate goal was that the proper position of the service provider would have been restored on ProZ: the service provider would once again be given the appropriate power to establish rates and working conditions. That would have sent an enormously powerful message to other online clearinghouses and, more importantly, to the outsourcers who advertise on ProZ (the vast majority of which are agencies). Above all, it would have brought balance back to the negotiations that naturally take place between someone who needs a translation and someone who can provide one. The long-term goal is that a shift in ProZ’s policies regarding job postings could have served as an important educational and ethical tool for translators themselves. Having to propose your own rates—rather than wait for them to be imposed on you—means evaluating your services: What do you actually provide? What makes you different from or better than other translators in your language combination? Why should a client pay your asking rate? Those are all aspects of calling oneself a professional, and they’re good questions for translators to be asking themselves. That’s how perverted the market has become, and that’s why online jobbers have not only earned our criticism, they’ve focused our attention on our need for self-defense. Totally agree with you. I will read your info more carefully and I will post it in my facebook and I may write a post in my blog. Thanks your your honesty. I completely agree with you. I have been appalled by the rates offered on ProZ… 300 words for 10 euros, no matter how complicated the text is… Most of the time, the client requires SDL trados Studio in order to cut prices down (fuzzies, repetitions etc. are reduced by 66%). isn’t this the way globailisation works? It’s utterly painful… but as telecoms costs and the cost of computers decline people in the Developing world with language skills start to compete. 300 words for 10 Euros is no doubt a huge amount for most Indian people for example. If you still regard translation as a *profession*, and one with a future, good luck. Because I suggest that most serious translation companies need people with a real profession (medicine, electronics, the law, whatever) combined with good language skills. I would not recommend any young person to go into “translation” … unless of course they mean the people sitting in the offices, tearing their hair out about file conversion, formatting, XML tags and all the rest, not to mention the actual quality of the translations they’re sent… yes, it’s a 21st Dickensian nightmare … and with machine translation surely it can only get worse. The bottom line is simple, you don’t like the rate, don’t bid on the job. If no one respond to a job offer, the rate may be risen or the job cancelled. Still, I took the time to carefully read this poster complaint. I was wondering if it took in consideration the need of others rather than it own selfish agenda. Because, while he is right that some jobs posting are ridiculously low priced, no one is forced to bid on them. Extremely thorough, thoughtful, and original analysis, “James” of the fake address “leverage@yahoo.fr.” It is incomprehensible that such irrefutable logic as yours has failed to halt the capitalist exploitation of workers. You’ve blown us all away not solely because of your grasp of economics but because of your clear, not at all “let-them-eat-cake”-ish approach to the human issues involved in an industry that depends on screwing people over for profit. 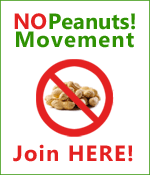 Perhaps we should change our name from No Peanuts! to No Tools!, but we suspect idiots like you would continue to write.